Ernst Felix Immanuel Hoppe-Seyler (26 December 1825 – 10 August 1895), né Felix Hoppe, was a German physiologist and chemist, and the principal founder of the disciplines of biochemistry and molecular biology. Hoppe-Seyler was born in Freyburg an der Unstrut in the Province of Saxony. He originally trained to be a physician in Halle and Leipzig, and received his medical doctorate from Berlin in 1851. Afterwards, he was an assistant to Rudolf Virchow at the Pathological Institute in Berlin. Hoppe-Seyler preferred scientific research to medicine, and later held positions in anatomy, applied chemistry, and physiological chemistry in Greifswald, Tübingen and Strasbourg. At Strasbourg, he was head of the department of biochemistry, the only such institution in Germany at the time. His work also led to advances in organic chemistry by his students and by immunologist Paul Ehrlich. Among his students and collaborators were Friedrich Miescher (1844–1895) and Nobel laureate Albrecht Kossel (1853–1927). He was the son of the Freiburg superintendent (bishop) Ernst August Dankegott Hoppe. His mother died when he was six years old, and his father three years later. After he became an orphan, he lived for some time in the home of his older sister Klara and her husband, the Annaburg pastor Georg Seyler, a member of the noted Seyler family, a son of the pharmacist and Illuminati member Abel Seyler the Younger and a grandson of the theatre director Abel Seyler. He eventually entered the orphan asylum at Halle, where he attended the gymnasium. In 1864 he was formally adopted by Georg Seyler and added the Seyler name to his birth name. In 1858 he married Agnes Franziska Maria Borstein, and they had one son, Georg Hoppe-Seyler, who became a professor of medicine in Kiel. Felix Hoppe-Seyler, a physiologist and chemist, became the principal founder of biochemistry. His text Physiological Chemistry became the standard text for this new branch of applied chemistry. His numerous investigations include studies of blood, hemoglobin, pus, bile, milk, and urine. Hoppe-Seyler was the first scientist to describe the optical absorption spectrum of the red blood pigment and its two distinctive absorption bands. He also recognized the binding of oxygen to erythrocytes as a function of hemoglobin, which in turn creates the compound oxyhemoglobin. Hoppe-Seyler was able to obtain hemoglobin in crystalline form, and confirmed that it contained iron. Hoppe-Seyler performed important studies of chlorophyll. He is also credited with the isolation of several different proteins (which he referred to as "proteids"). In addition, he was the first scientist to purify lecithin and establish its composition. 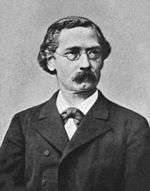 In 1877 he founded the Zeitschrift für Physiologische Chemie (Journal for Physiological Chemistry), and was its editor until his death in 1895. He died in Wasserburg am Bodensee in the Kingdom of Bavaria. 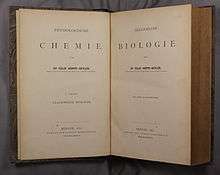 Physiologische Chemie (4 volumes, 1877–81). Zeitschrift für Physiologische Chemie (1877–1921). 1 2 3 Jones, Mary Ellen (September 1953). "Albrecht Kossel, A Biographical Sketch". Yale Journal of Biology and Medicine. National Center for Biotechnology Information. 26: 80–97. PMC 2599350 . PMID 13103145. ↑ "Hoppe-Seyler, Felix". Complete Dictionary of Scientific Biography. Retrieved 8 May 2015.